The Lord of the Rings: The Fellowship of the Ring is a 2001 fantasy adventure film directed by Peter Jackson based on the similarly titled first volume of J. R. R. Tolkien's The Lord of the Rings. Set in Middle-earth, the story tells of the Dark Lord Sauron (Sala Baker), who is seeking the One Ring (Alan Howard voice). The Ring has found its way to the young hobbit Frodo Baggins (Elijah Wood). The fate of Middle-earth hangs in the balance as Frodo and eight companions form the Fellowship of the Ring, and journey to Mount Doom in the land of Mordor: the only place where the Ring can be destroyed. In 2002, the movie won four Academy Awards out of thirteen nominations. The winning categories were for Best Cinematography, Best Effects (Visual Effects), Best Makeup, and Best Music (Original Score). Despite its praise by fans, the other nominated categories of Best Actor in a Supporting Role (Ian McKellen), Best Art Direction-Set Decoration, Best Director, Best Editing, Best Music (Best Song) (Enya, Nicky Ryan and Roma Ryan for "May It Be"), Best Picture, Best Sound, Costume Design and Best Writing (Best Screenplay Based on Material Previously Produced or Published) were not won. As of February 2009, it is the 15th highest grossing films worldwide, with takings of US$870,761,744 from worldwide theatrical box office receipts. The movie won the 2002 Hugo Award for Best Dramatic Presentation. It also won Empire readers' Best Film award, as well as five BAFTAs, including Best Film, the David Lean Award for Direction, the Audience Award (voted for by the public), Best Special Effects, and Best Make-up. In June 2008, AFI revealed its "Ten top Ten"—the best ten films in ten "classic" American film genres—after polling over 1,500 people from the creative community. 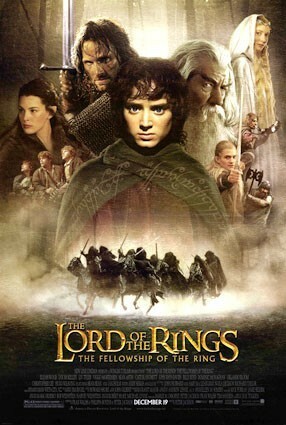 The Lord of the Rings: The Fellowship of the Ring was acknowledged as the second best film in the fantasy genre. Wikipedia: The Lord Of The Rings: The Fellowship Of The Ring"